The 23rd International Charity Bazaar will be organized on November 26, 2016 at the White Palace Convention Centre, 194 Hoang Van Thu Street, Ward 9, Phu Nhuan District by the Consular Club of Ho Chi Minh City. 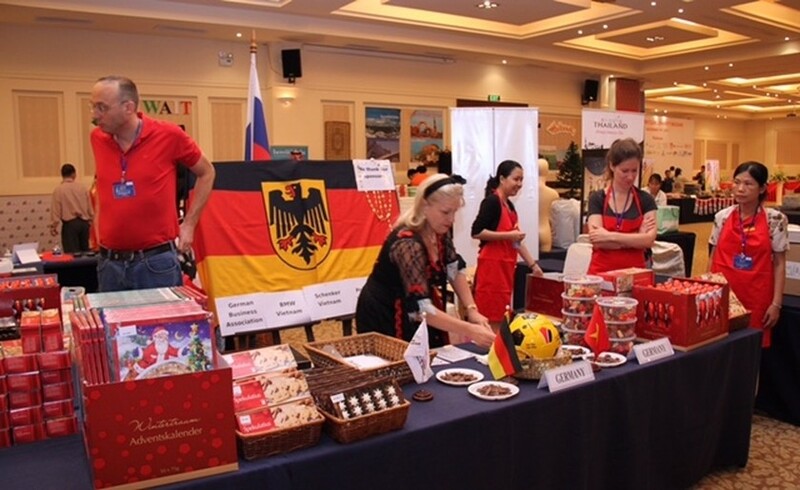 Germany country table at International charity Bazaar in 2012. The event will start at 9:30am and run until 2:00pm, aiming to raise fund for helping those less fortunate in the community. Projects supported by the Consular Club through funds have generated from the annual International Charity Bazaar range from scholarships to medical care, providing fresh water, building bridges, schools and more. All Consular Club members volunteer their time to work towards improving the quality of life of the unfortunates in Vietnam. This is the chance of purchasing a wide range of international goods and food at low prices, visitors can also purchase tickets in the popular Raffle. Raffle tickets are available for 50,000 VND each, and prizes include return airline tickets, vouchers for staying at deluxe resorts and hotels in many famous locations throughout Vietnam, spa packages, lunch or dinner vouchers in luxury restaurants in Ho Chi Minh City and much more. Every prize in the raffle is valued at more than US$100. This year’s event is in the continuation of the tradition of past International Charity Bazaars’ – selling goods and food from all over the world for a good cause. For further information on the Charity Bazaar (including limited advanced ticket sales and raffle tickets), contact the Consular Club at consularclub@gmail.com or the Consulate General of the State of Kuwait at 24 Phung Khac Khoan Street, Da Kao Ward, District 1, Ho Chi Minh City, telephone: (84-8) 3827 0555. Entry tickets cost 100,000 VND for adults, and children under 10 accompanied by an adult can enter free of charge. The Consular Club of Ho Chi Minh City is a non-political and non-profit organisation. Members of the club come from various foreign consular missions in Ho Chi Minh City. The Thien My B Primary School is located in the Soc Trang Province, which is a rural area with a poverty rate of 31.26%. 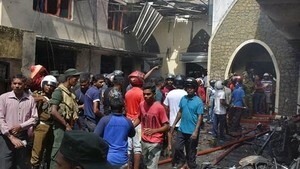 Most of the pupils are from families with a low level of education. The Consular Club donated new tables and chairs to the school in order to improve the teaching environment. 397 pupils and 17 teachers will benefit from this project every year. Together with the Ho Chi Minh City Union of Friendship (HUFO), the Consular Club presented 200 Tet gift packages to underprivileged families in Vietnam. The Sponsoring Association for Poor Patients in HCMC (SAPP) is a social organization, which was established to help patients from disadvantaged backgrounds, especially children and disabled people. This includes assisting with their medical treatment, helping them to integrate into society and to achieve their goal of having a stable life with social security. SAPP received three industrial rice cookers from the Consular Club – one for each of their three Charity Kitchens. The Charity Kitchens provide free lunch and dinner for poor patients in the hospital. The Consular Club provided 80,500 Acia Mangium trees to be planted on 11.5 hectares in Thang My. The project helps to create jobs and increase income for 40 underprivileged households in Thanh My town, Quang Nam province. For the second year in a row, the Consular Club provided uniforms, health insurance, school supplies, and a literacy program for approximately 145 children in the St. Joseph’s Orphanage and Free School. 7. Binh Trieu Development Centre & Warm Shelter & Binh An Development Centre - Binh Trieu, and HCMC. The Consular Club donated funds for first aid and emergency medicine, first aid kits, uniforms and scholarships for approximately 560 children in the Binh Trieu Development Centre and Warm Shelter and Binh An Development Centre. These centers provide education, healthcare and life-skills training to street, working and migrant children and families in the Binh Trieu and District 8 areas of HCMC. The Consular Club donated one sterilization machine to the organization, in order to ensure greater hygiene for the cups and bowls used to feed the children. The children are extremely susceptible to infections due to their (HIV) reduced immune systems. The Consular Cub provided school and university fee scholarships for 280 students through Dat Viet and Gia Dinh Co Don. Dat Viet supports 240 children from Ben San Leprosy Center in Khanh Binh Village. Gia Dinh Co Don covers school and university fees for 40 underprivileged children and students from orphanages in Tan Phu district, Loc Ninh, Loc Dien and Loc Tan areas. An Ninh Secondary School is located in a very poor and remote commune in the Duc Hoa district, Long An province. The water supply is limited and it is infected with salt and alum rendering it unhygienic to drink. The only solution for clean water is a deep well with a filtration system. The water filtration system provided by the Consular Club will help ensure the good health and hygiene of 930 pupils and 69 teachers. Kong Pak district in the Dak Lak Province is a poor and mountainous area populated with 23 ethnic groups. The women and children have little access to healthcare. The Consular Club provided financial aid for dental care for 1,200 children, and for gynaecological check-ups for 400 women. The Consular Club sponsored the “Light and Believe” annual music performance and granted scholarships to disabled children in Ho Chi Minh City for the occasion of the annual Handicap day on April 14th. The performance aims to help disabled children integrate into the community and to gain self-confidence. The Club provided health care insurance, emergency medicine and first aid provisions, therapy shoes for those in need, speech and physical therapy, monthly medicine or hospital visits, IDD health check-ups, IDD skill training and outings for the orphans/abandoned children and the 11 elderly people living at the Te-Phan Loving Family Orphanage. The Club has provided funds for the second phase of the project: building a deep, water well, which will provide clean water to the community at a minimal cost. In addition to religious service the Parish offers free tutoring to children up to 9th grade. The Consular Club provided funds for school fees for the 2016 - 2017 calendar year for the children who are being taken care here.